Today is the 117th running of the Boston Marathon on Patriot’s Day. More than 27,000 people entered the race. The Boston Marathon is the nation’s first and most prestigious marathon, but now there are over 3,000 such marathons world wide. There are more people running marathons today than ever before. I’ve been studying the marathon, exploring possible parallels to the growing maker movement. While not everybody will be a marathoner or a maker, more and more people are choosing to do something that is not easy to do, and finding it a rewarding personal accomplishment. The Boston Marathon started in 1896, inspired by the Olympic Marathon. For most of its first hundred years, only a few hundred people participated. They were very dedicated amateurs, but the field was small. However, a rapid increase in the number of people entering the marathan started in the late Sixties and peaked at the 100th anniversary of the race. So many people wanted to participate that race organizers had to limit the number of entrants. What interests me about marathoning, and I say this as someone who has never run a marathon and have not one ounce of confidence that I could ever do so, is that marathons are hard. Running marathons haven’t gotten easier, but more people are able and willing to do it. Now, of course, the growth in participation parallels a growing interest in health-and-fitness, a movement that popularized jogging and jazzercise. Yet jogging is comparatively easy and joggers don’t necessarily become marathoners. As technology has become easier to use, users are the equivalent of joggers. Making, when compared to using, is harder; it is challenging. Yet that’s what makes marathoning more interesting than jogging; the bigger the challenge the more satisfying the reward. The rise in participation is marathons is driven by amateurs. They race not to win a prize, but often just to finish the race — and set a personal goal. Some run as a part of a club or group. There is roughly the same number of elite marathoners in the race. 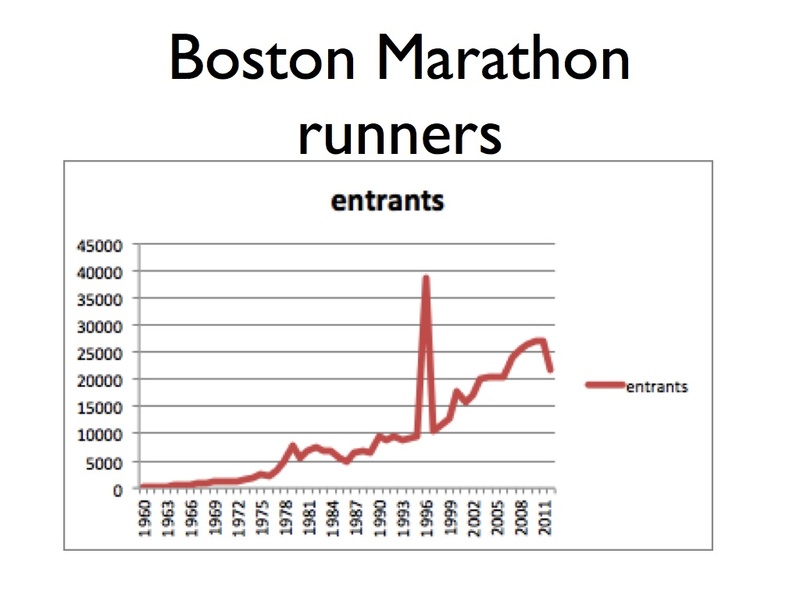 However, prize money for winners was introduced in 1985 so the Boston Marathon has always been an amateur pursuit. The maker movement is driven by amateurs, which is to say that participation is personal and social. People find their own reason to run a marathon or start a hobby or initiate an ambitious project. Runner’s World started as a magazine in 1966, and a “running boom” occurred in the 1970s and 1980s that engaged 25 million people. The first running shoe was introduced in 1938. Much later, Blue Ribbon Sports got its start in 1964 and its waffle trainer (a maker story of its own) was introduced in 1974 but the company was named Nike in 1978. You could call marathoning a social movement not directed by anyone or any single interest. It was started by an elite group of amateur, some of whom became professionals and then more and more amateurs started running. 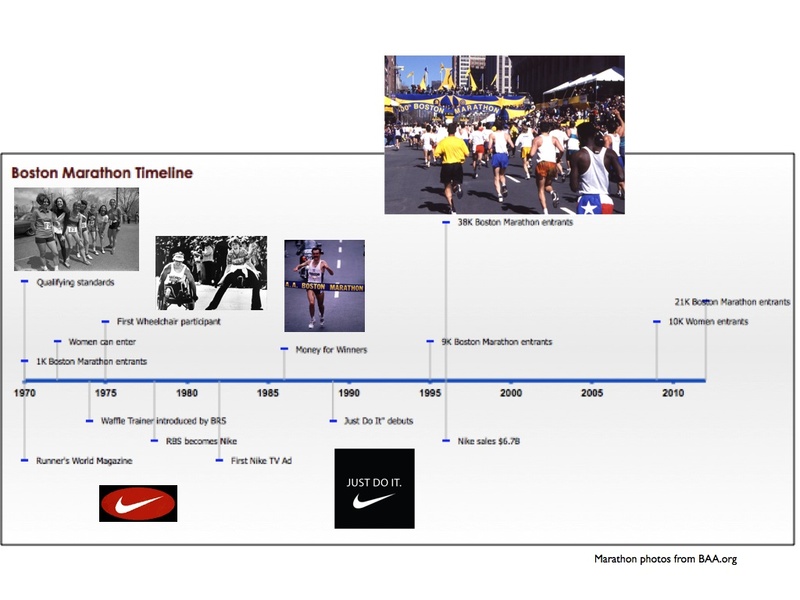 Marathoning gave birth to an industry and industry giants like Nike. A number of personal and social interests really did converge to spur the growth of marathoning, and I’d like to use them to understand the present and future of the Maker Movement. I created this timeline to mark some of the important events over the years. Perhaps you see some of the parallels yourself. What accounts for the growth of marathoning? First, the number of races in more places increased. You didn’t have to go to Boston because the Boston was replicated in many different places. Today there are about 1,200 full marathons around the world. Maker Faire, which we started in the Bay Area, is a marathon of sorts for makers. Last year, there were 60 Maker Faires worldwide and the number will surpass 100 this year. Events offer a deadline for participation and recognition for the accomplishments of the participants. Second, marathons became more open and inclusive. Women were allowed to participate in 1972 and by 2009, there were 10,000 women entered in the race. While women have not been excluded intentionally from making, more should be done to encourage women to participate. Increasing the diversity of participants is an important factor for the continued growth of the maker movement. Ultitmately, what made it easier for more people to participate in a marathon was better and more accessible training. Track clubs began offering training programs that made this offer: If you were willing to train, we can train you to run a marathon. You didn’t have to be a “born” runner. You just had to be willing to train. Also, you didn’t have to train alone. You could find a group of people who wanted to train like you and this group would have a trainer or coach. Better coaching and preparation have helped more people meet the challenge. For the maker movement to continue to grow, we need to offer better and more accessible training for aspiring makers. Makerspaces play an important role in future growth of the maker movement. Makerspaces help to on-board new people by providing access to training and creating a supportive environment where more people can learn to do something that they might have thought was too hard for them to do. They can also help makers get better, improving their ability to create and make something, often by joining forces with others who share a common interest. Makerspaces provide access to tools, materials and expertise but they also provide a meaningful context for makers to grow and develop. Congratulations to today’s winners of the Boston Marathon and to all who participated in the race. I wrote this post while in Cambridge, MA watching the Boston Marathon on TV. After it was published, I learned about the terrible explosions at the finish line of the race. I am shocked and saddened for those who lost their lives and the many more who were injured. My heart goes out to all the families as well as the race organizers and participants.